Marlboro, NJ | 14 October 2016 – In celebration of its 55th anniversary, KEF proudly presents LS50 Wireless, a complete and fully active music system. 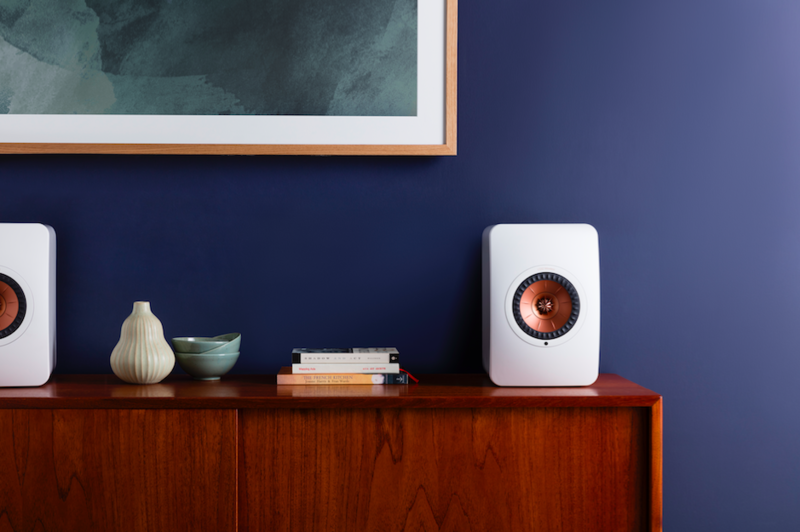 Sharing the same winning acoustic features of KEF’s renowned LS50, LS50 Wireless enables the user to easily enjoy excellent music reproduction, previously only achieved with a system comprised of separate high quality components. Five years ago, with the belief that everyone deserves to experience quality sound, the LS50 passive speaker was introduced at KEF’s 50th anniversary. Now, at its 55th anniversary, KEF has developed a complete, fully active system that retains all the acoustic features and benefits of the passive LS50 within an active system that has been designed to allow a multitude of connectivity options. The FEA-designed cabinet, Uni-Q driver, constrained layer damping bracing, precision-made curved baffle and elliptical flexible sound port, all part of the LS50 pedigree, are retained. These features prevent cabinet vibrations, enhance radiating sound, and reduce resonances and colouration. New additions include an end-to-end 192kHz/24-bit high-resolution digital signal path, two dedicated DACs per channel (4 DACs in total), a streaming pre-amplifier and factory-optimised amplification in a bi-amp dual-mono configuration (200 + 30 watts per speaker). Combined with a time-correcting DSP crossover, the incredible award-winning sound of Uni-Q is taken to the next level. To make the LS50 Wireless a total high-performance music system, a comprehensive range of connection options are available, including 2.4GHz/5Ghz Dual-band Wi-Fi, Bluetooth 4.0 with aptX codec, Asynchronous USB Type B input, TOSLINK Optical and RCA line-level analogue inputs. A dedicated app for LS50 Wireless, available on both iOS and Android, enhances the user experience during network setup, music streaming, playback, and control. The app also includes 3 user levels of customisable EQ settings for personal music preference. Purchased separately, replicating the performance of the LS50 Wireless system using a traditional Hi-Fi setup would cost far more, and with all of that time, effort and money, you would still not be guaranteed to own a system that is matched so perfectly. The LS50 Wireless allows the customer to enter the awe-inspiring world of high-fidelity audio without the need for separate components. Audiophile grade amplification and sound processing are combined to bring a true high-fidelity listening experience to active streaming audio. KEF’s unique advanced time correcting DSP crossover ensures perfect time alignment between low and high frequencies so that every note and frequency arrives to the listener at the same time. Pairing this with our Uni-Q driver technology, the result is sound dispersion unlike any you have ever experienced. Because of the finely engineered sound dispersion properties of KEF’s Uni-Q driver, this theoretical ideal is now a reality in almost every room and listening environment. KEF’s LS50 Wireless is truly bringing state-of-the art technology and the audiophile listening experience to every music lover. Visit KEF.com for more about KEF and its products.